Once upon a time, there was a boy who really wanted to go to Legoland. He really didn’t care whether it was Florida or California, but he wanted to go. Because my son is very tall, I was afraid that Legoland might not work for him. 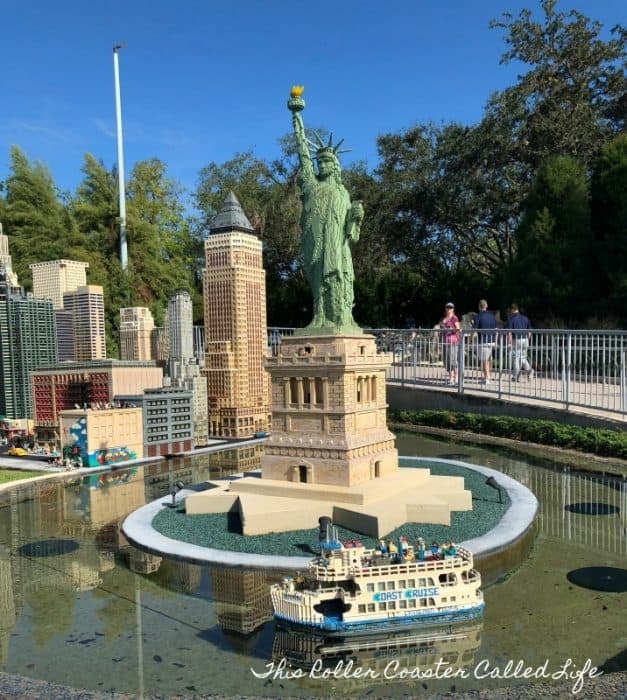 When we planned our trip to Florida for a cruise late last year, we decided to see if Legoland Florida would be an option. 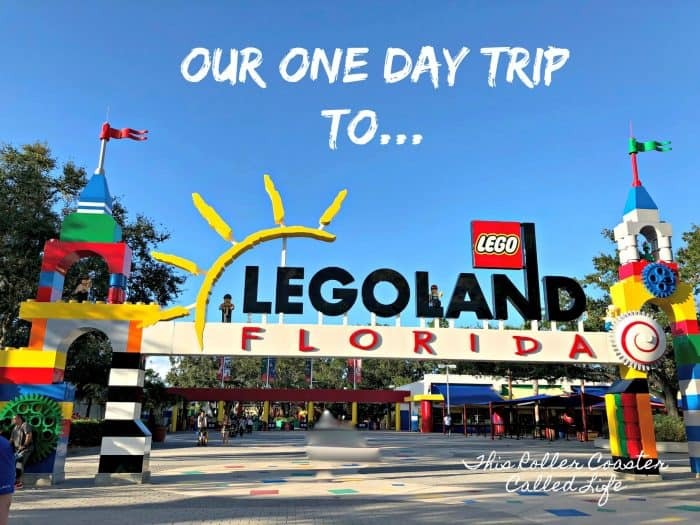 A coworker of mine had just come back from Florida and assured me that there was enough for adults to do, so we looked into the possibility of adding a day at Legoland Florida to our trip. We secretly arranged a night at the Legoland Hotel that would work with our travel schedule and very impatiently waited until it was time to leave before telling Marvel Boy where we were going. Not soon enough, the morning we were to leave arrived, and we headed out on the road. We were a ways down the road before Songbird told Marvel Boy what our first Florida destination was. He was SO excited! He immediately started following the Quest to Legoland-A GPS Adventure app. He enjoyed the games on the app but found that it didn’t seem to track us very accurately and lagged behind our location. He also started researching the park on my phone. 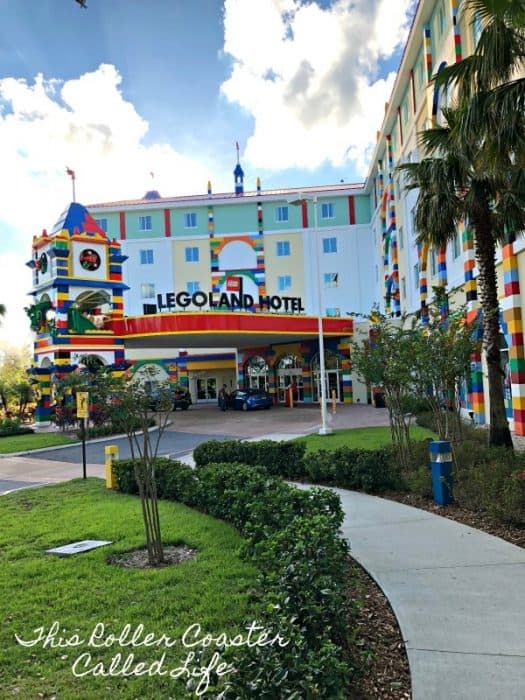 It seemed to take forever, but we did finally arrive at the Legoland Hotel (post to come later) to rest before our one day park adventure. and our map and informational packet for the day. 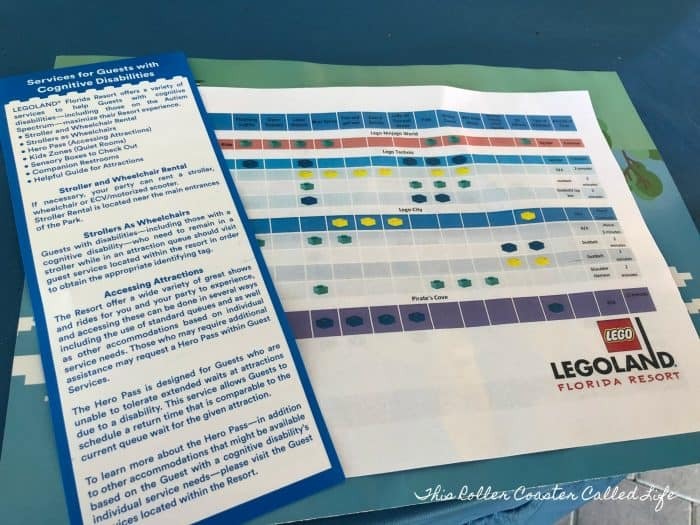 I must say that I LOVE how Legoland Florida lays out the ride information, so I was able to make an informed decision about what Marvel Boy would like to ride and what to steer him away from. It is a great resource for those families with kids on the Autism Spectrum or other Sensory Processing Disorder issues! 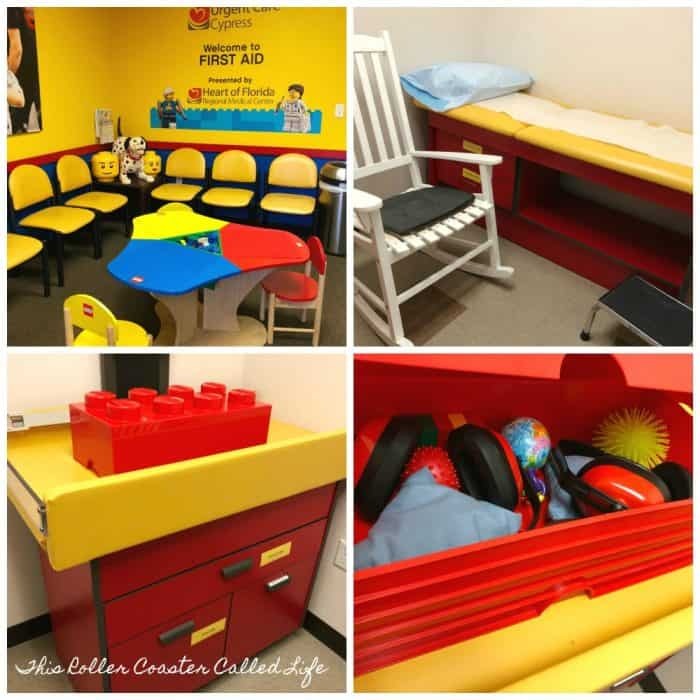 The map also lays out places where parents whose child has hit that special point of sensory overload (those with children on the Autism Spectrum know exactly what I mean) can take their child to calm down. We visited one of the places on the map. 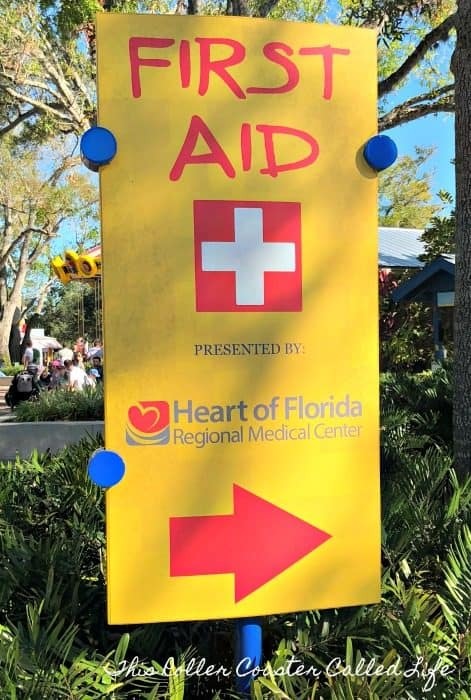 It was in the first aid station near the front of the park. This particular spot had a rocking chair, office “bed”, and a box of sensory toys (ear protectors and “squishies”). One thing I did note was there wasn’t a dimmer on the lights in this room. They were either off or on very brightly. However, that being said, I think this was a well-thought out space for those in sensory overload to go and decompress. 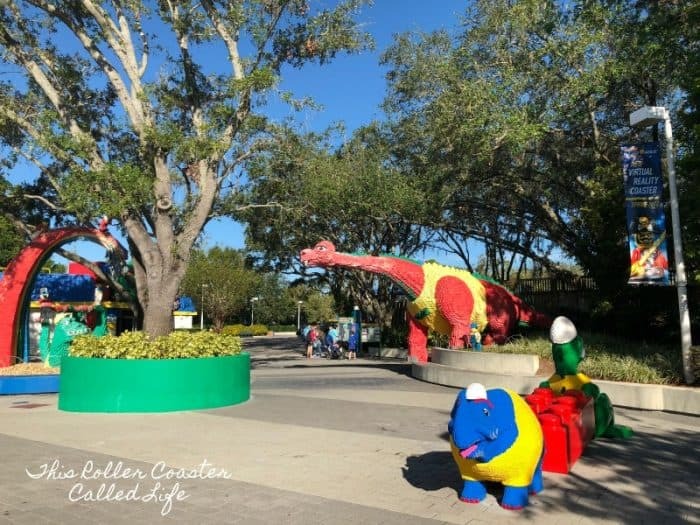 Having covered one of the most important things I wanted to point about about Legoland Florida, let’s talk about the park, itself. Marvel Boy’s eyes were WIDE when we headed into the park! He loves ALL things Lego, and he was definitely in his element from the first moment he stepped into the park. I wasn’t overly surprised to see that he had to stop in The BIG Shop right inside the entrance gate. Whoa! 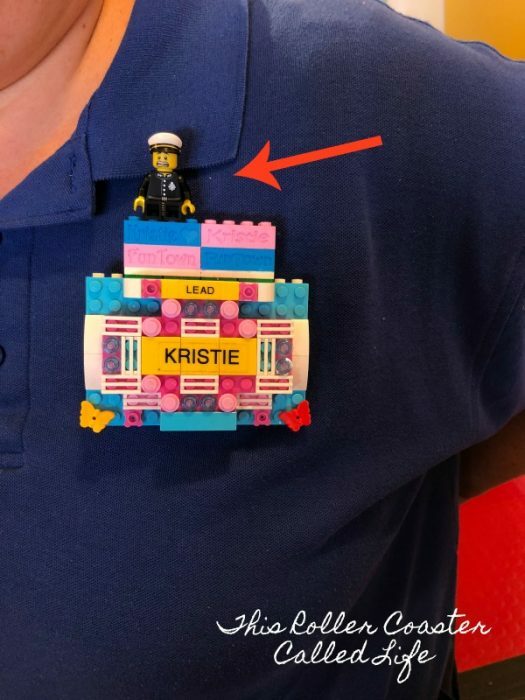 Talk about Lego merchandise! 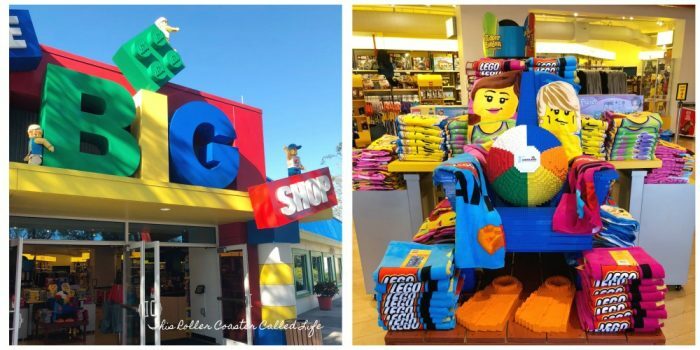 There were a lot of souvenirs and Lego sets to be seen here and in the other shops in the park. Of course, this was my first stop. 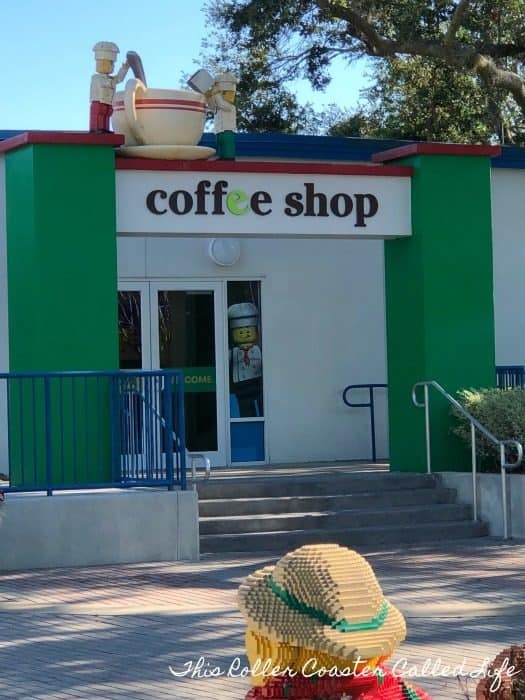 I was happy to grab a cup of coffee before heading out into the rest of the park. 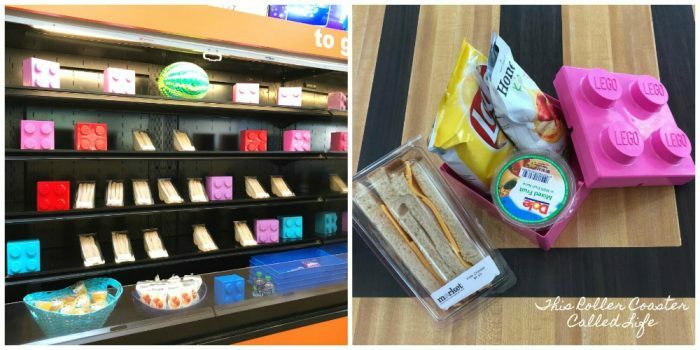 As a side note, we also had lunch in the grab-n-go restaurant attached to the coffee shop. It had what the kids wanted to eat, and Marvel Boy still uses the box (dark blue) that he chose to go with his meal. Songbird chose the pink box. 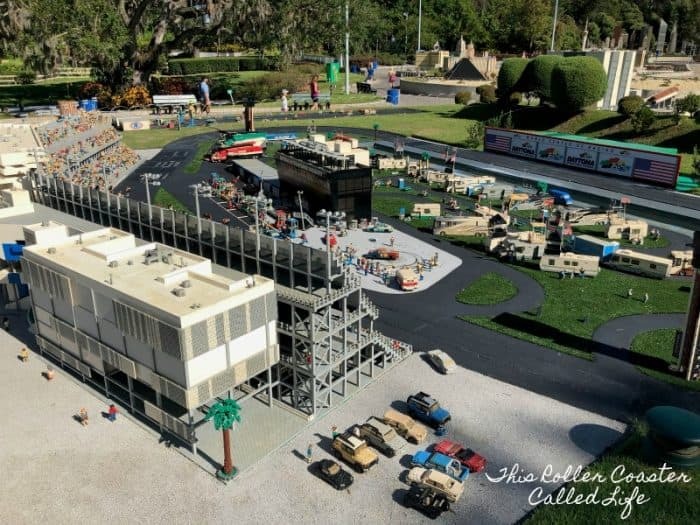 Like most parks, Legoland Florida is divided up into lands. The park was built on the site of the former Cypress Gardens, and as such, there is a lot of vegetation for shade. 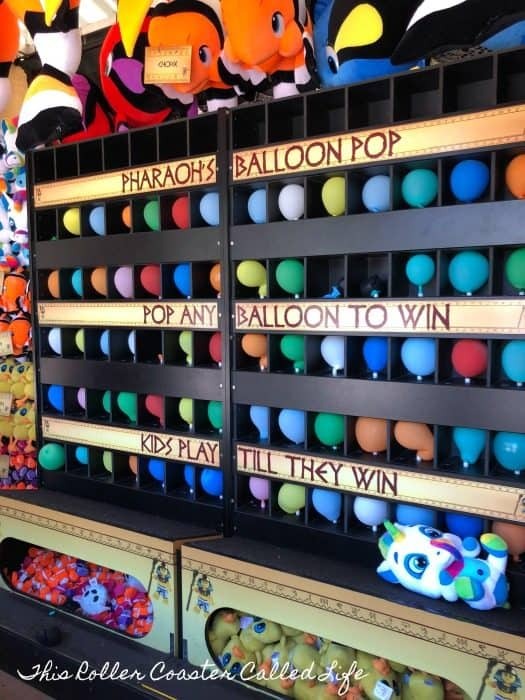 Like most parks, Legoland Florida also has games to play for prizes. I love that kids can play until they win, at least on this game. Just remember, there is an additional charge for these games. 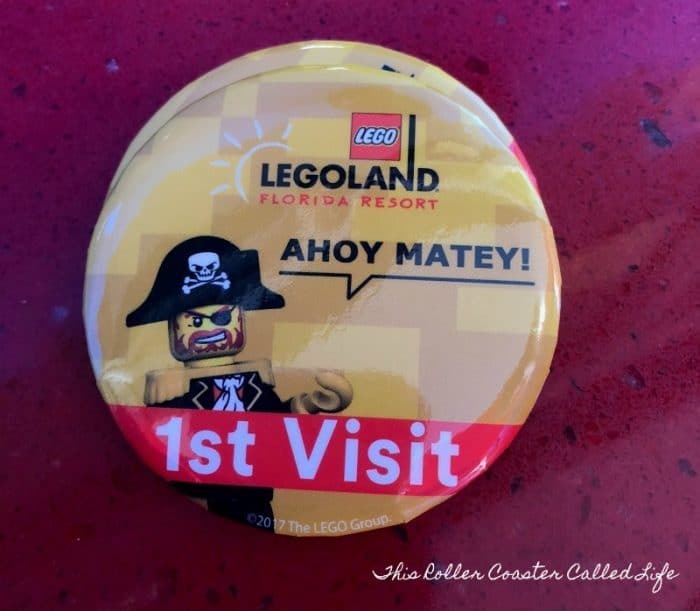 Another Florida set of parks might have their pin trading; however, Legoland Florida has mini figure trading. We knew that Marvel Boy would love doing this, so we bought some mini figures for him to trade. I’ll tell you that he was really surprised to hear about this! It was a LOAD of fun trading mini figures! 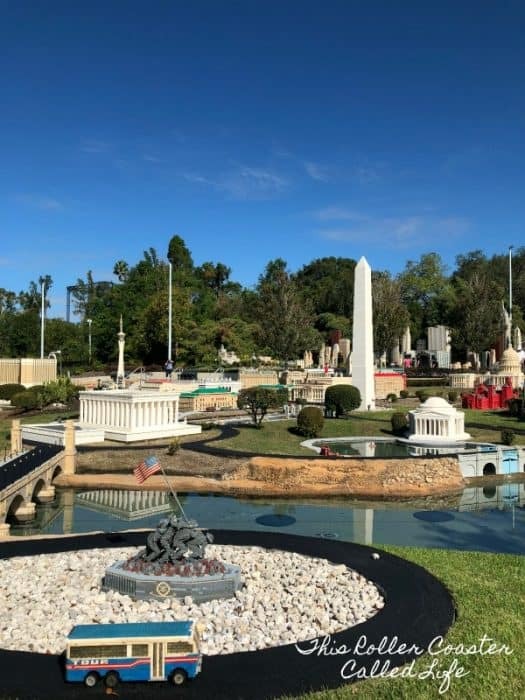 I was really looking forward to going to Legoland to see the displays made out of Legos, and I don’t think any of us were disappointed. There was something for everyone in these displays! It was cool to see the Daytona 500! 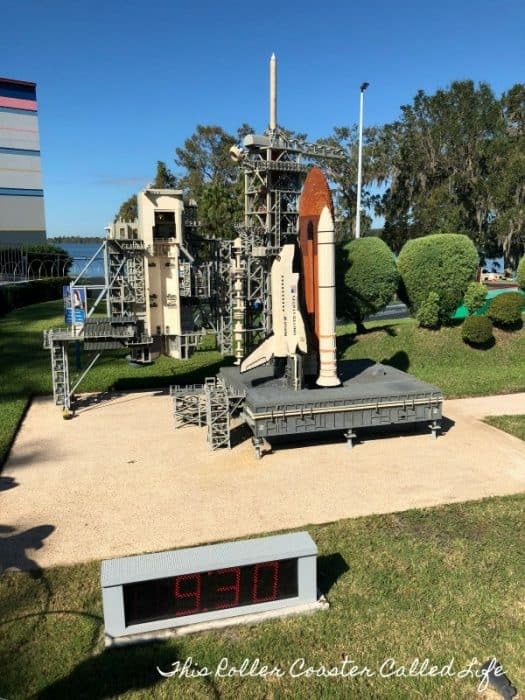 And look at the shuttle launchpad! The presentation of Washington D.C. is so lifelike! The Statue of Liberty in New York City is also amazing! 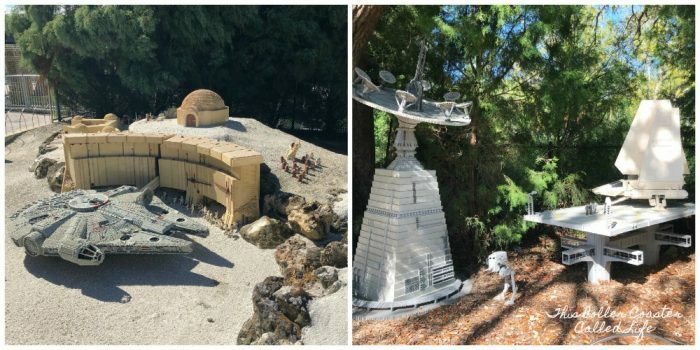 I can’t believe this is all done with Legos! I think the kids’ favorite area had the Star Wars displays. The displays looked just like in the movies! 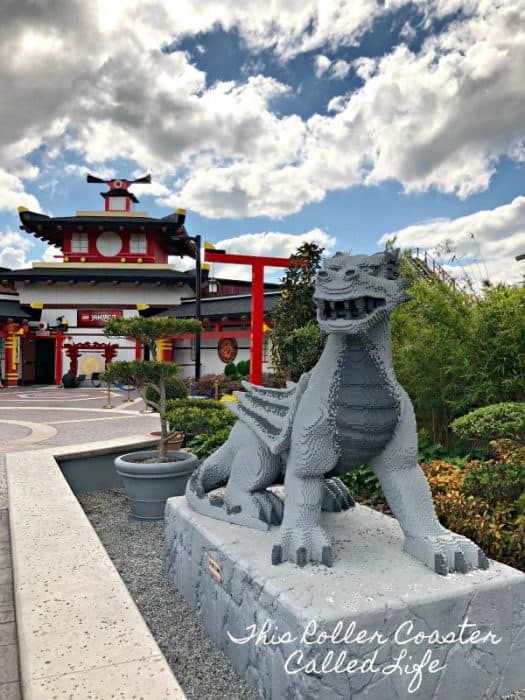 Legoland Florida is not just Legos. There are also plenty of rides here, too. 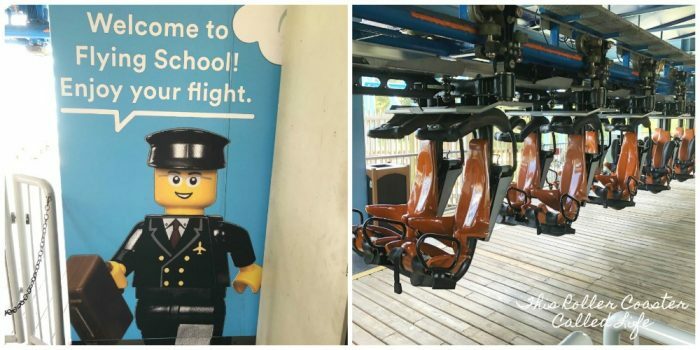 You can check out the available rides on the Legoland Florida website. 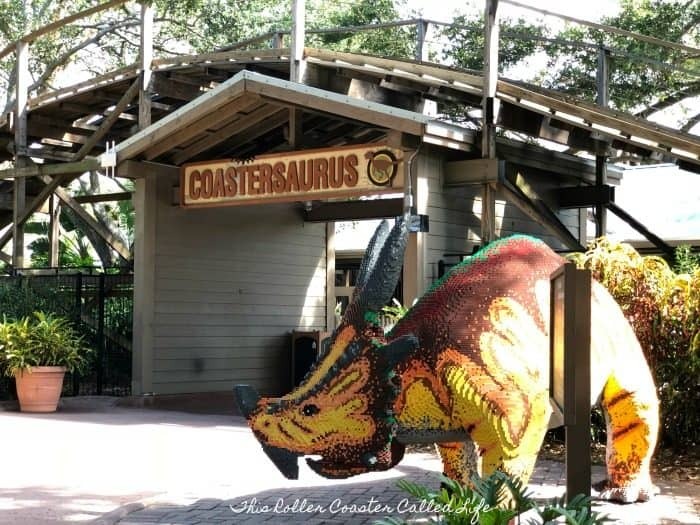 Coastersaurus was a big hit with the family! As was the Flying School! Songbird really wanted to ride a roller coaster that was suspended from the top, but all the ones we had seen contained loops. Songbird can’t do loops, so Flying School was a good fit for her! It was warm that day. Not summer hot, but hotter than what Marvel Boy likes. 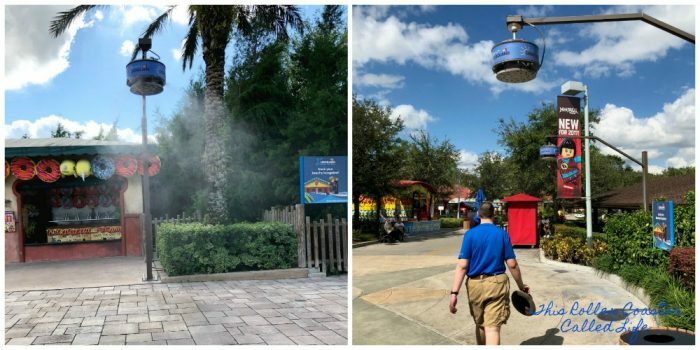 We were very thankful for all the shade at this park, but also for the misters that are at Legoland. It is a really nice touch! So, the big question is probably whether or not this park can be done in one day. My short answer would be no. 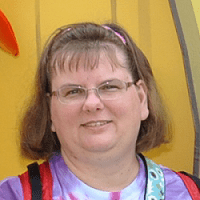 We didn’t get to see the Pirates Cove Live Water Ski Show. We also didn’t go during water park season, so we didn’t have to budget time for that in our day. I know that there were things that Marvel Boy wanted to go back and do again, and he also missed doing some things he wanted to. Also, Legoland Florida is not open as late as some other parks. For this reason, I think that if you are taking the time to go, do two days if you are able to take the time for it. I think it would definitely be worth it to do the second day. 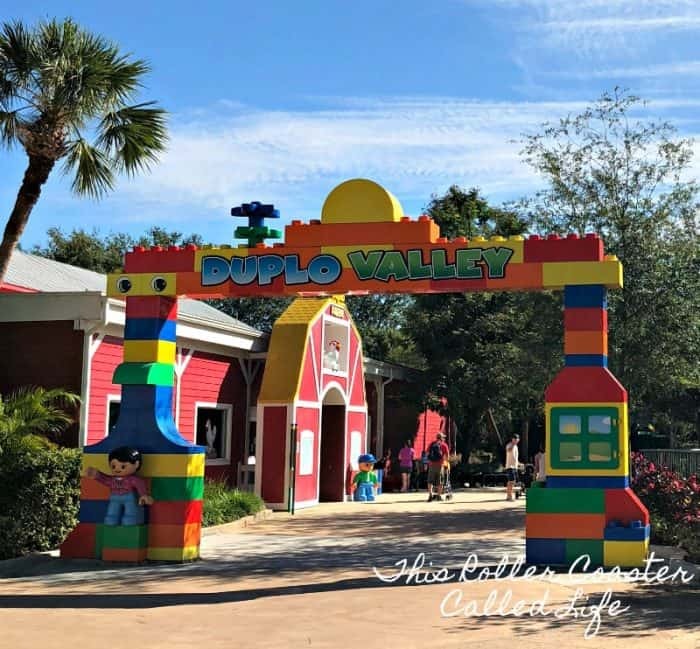 We found that it was easy to head over to Legoland Florida and then continue on with our other plans in Florida. It is a little ways away from most of the other Florida destinations, but it really wasn’t that far. Also, if you can do a night at the Legoland Hotel, I would highly recommend it! I’ll be posting about our stay there shortly. It was so close to walk from the Legoland Hotel into the park! Plus, it is an experience you can’t get anywhere else! Disclosure: We received free admission to the park for one day; however, we paid for our own hotel and food. All opinions are our own.